Certainly, timesheets, benefit accrual, overtime, garnishments, payroll taxes, tax regulations are just some of the challenges of doing payroll yourself. Because of these demands, many small businesses payroll is an inefficient and overwhelming task. As a result, outsourcing this payroll services can save your company money and ease your workload. With several locations in Michigan, we can meet the payroll services requirements for a wide range of business accounting clients. In fact, we have offices in Saginaw, Bay City, Midland, St Charles, Sparta, and Grand Rapids to meet your needs. 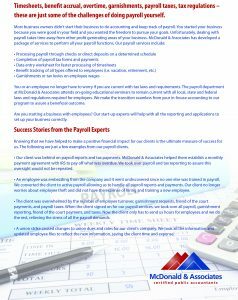 For more information, download our pdf on our payroll services. Please contact me about your payroll services.